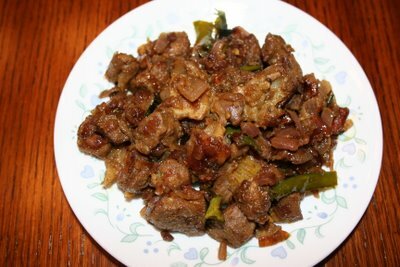 Mutton used to be my favorite in India and also readily available. Here in Colorado, I have to drive 1hr one way to get goat meat, so its becoming an exotic dish lately. Also because of this I end up buying it in bulk and hence will be relishing on mutton for a whole week. So this week I will be posting a few goat meat recipes. This is a very dry dish which is a bit spicy but can be served with rice or just as an appetizer. Pressure cook the mutton with jeera, saunf and a pinch of turmeric with just enough water to cover the meat, for about 8 whistles. Heat oil in a pan and add chopped onions. Once the onions turn translucent add green chillies, curry leaves, ginger garlic paste, pepper powder, jeera powder, coriander powder, garam masala, salt and the cooked mutton. Fry in low heat till all the raw smell disappears from the powders and the mutton gets coated and roasted evenly. Serve hot with rice and sambar. I had a muslim friend in B'lore who used bring all these mutton dishes,still remember the taste. Dish looks delicious,wish I could have some. Deepa, although I don't eat meat, my mouth is watering looking at this mutton varuval. I'll definitely try cooking this for my husband. Raj: Thanks for noticing. Ive made the necessary correction. Now I know that people actually read my recipes. Also as per your suggestion this might actually work for blood pressure patients. you u have any other good recipe to share. If yes, can u email them to me pls ? Awesome. Wonderful receipe!Very helpful to singles away from home. Really a delicious mutton chukka..I tried this as soon as I saw this post n it came out so well that me n my hubby in swizz enjoyed having this...Thanx for the recipe..
Can Mutton Sukka also have Tomato paste or finely diced and sauted Tomatoes?. In some Chettinad restaurants in Southern Tamilnadu districts, 'Mutton Sukka' has Tomatoes, and 'Mutton Sukka Fry' is the same thing fried again with some extra onion and more dry. For me the less dry version (Sukka) tastes better, and i believe they used either groundnut oil or at least a bit of Sesame oil. Please give your opinion, Thanks.